Event engagement is no longer optional. If you aren’t getting people connected to your event message and each other, you might as well be hosting your event in a vacuum. When was the last time being passive paid off? If anything actually came to mind, it was most likely a combination of timing and luck that led to any sort of positive outcome. It’s probably much easier to think of instances where taking an active role truly won the day. School, work, relationships – it all takes effort. We all want to plan engaging events. We want curious attendees and dynamic exhibitors. We want social shares and repeat customers. The truth is that your attendees are only going to drive so much of the event engagement. At the end of the day, it’s up to us – the organizers – to find ways to foster the connections that make an event meaningful. Knowing how to engage attendees starts with knowing what event engagement really means. It’s time to start thinking like an attendee and experiencing your event at their level. Knowing their event engagement expectations can help set your event’s expectations. In general, attendees are looking to connect with three things at your event – your message, your world, and each other. First and foremost, people are coming to your event to connect with you. From the keynote to the afterparty, there’s something specific about your brand’s message that has drawn them to this event. Keep in mind that while your overall message is defined by your organization, the event-specific message is created and begins with the earliest communications with your attendees. Think about what each piece of your event is communicating about your brand. Your registration process, your choice of mobile app, your keynote speaker, your swag – they’re all touchpoints and potential moments for attendees to connect with your message. The clearer the event message, the more event engagement you’ll see. For your attendees, one of the great things about your event is that it will bring them into contact with people and vendors they might not have had the chance to interact with otherwise. Your sponsors, your vendors, your exhibitors, your guest speakers and presenters are all members of your “world” with whom you’ve provided attendees the chance to connect. Keep in mind that one of the major draws for most people is facetime with the guests that you’ve worked so hard to book. So give them the chance to have it! Arguably the most important aspect of event engagement is giving attendees the chance to connect with each other. We often work so hard to plan direct communication with attendees that it’s easy to forget that over the course of an event relationships are formed, deals are made and teams are strengthened. While it may not seem as though you have much control over this aspect of event engagement, simply recognizing it is the first step to building an event that facilitates it. Think about the moments of past events that left a lasting impression on you. Was it the details of a product release, or the personal connection you made with a fellow attendee that led to a sale? Fostering an environment of personal connection associates positivity and productivity with your brand in attendees’ minds. Now that you have an idea of the ways in which people are looking to experience event engagement, it’s time to figure out how to maximize it. While it may seem at the mercy of the willing participation of your attendees, you can actually exercise a great deal of control over the three aspects of event engagement. For Emily, the key is planning. “We take a look at the most important aspects of our event, and we build content around that.” Knowing why people are there will lead you to create interactive content that gets them engaged. Emily shared several ways that Rockhouse has increased event engagement. Note how these examples get the crowd engaging with each other and the event simultaneously. A picture is worth a thousand words – and pictures of people enjoying your event trump all the catchy marketing copy you could ever write. 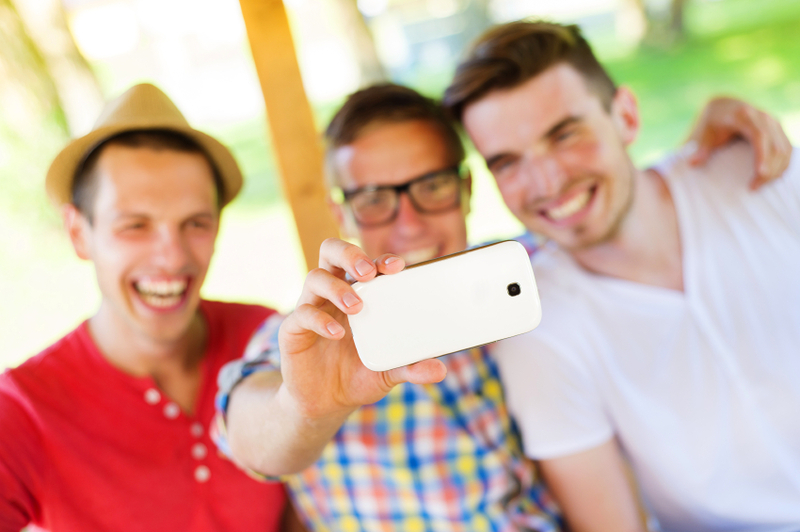 While attendees are hoping to see themselves on a jumbotron, digital photo wall, or inside the photo album of your event’s mobile app – folks at home are following along wishing they were there. It’s a one-two punch where you’ve engaged your current attendees and marketed to future ones at the same time. Predetermining your event hashtag is a must these days. It’s too important to just let attendees decide it for you. Choose your hashtag, promote it beforehand, and weave it into your marketing materials at the event itself. An event app like Guidebook will allow you to pre-load your hashtag into its Twitter module, ensuring that people are using it and following along. Think of the feed created by your hashtag as your event’s story. You can track the ebb and flow of your attendees’ sentiments and the attendees have a chance to engage with one another through social media. Just try getting a more effective audience barometer for the price (free). Everyone loves a free t-shirt. The most hardened of event attendees will go to great lengths for free swag. Check with your event sponsors or exhibitors for possible prizes and line up a few spontaneous contests during your event. Giveaways are an easy and effective way to incentivize event engagement and keep it going strong in the meantime. Rewarding simple actions can drive engagement and maximize participation. Use a push notification from your mobile app to ask for retweets or encourage attendees to fill out your feedback form. While gunning for that pair of tickets to the baseball game, they’ve invested in your event on a deeper level. With the data rolling in from your event tech tools and your feedback surveys, you have yet another route to strengthen event engagement. What is the data telling you about the way attendees behave at your event? And how can you use it to your advantage? With Guidebook, event attendees have the ability to create digital contact cards and swap them with their fellow event attendees. We took the top four events where people had swapped the most contact cards and mapped it out over the day of the event. 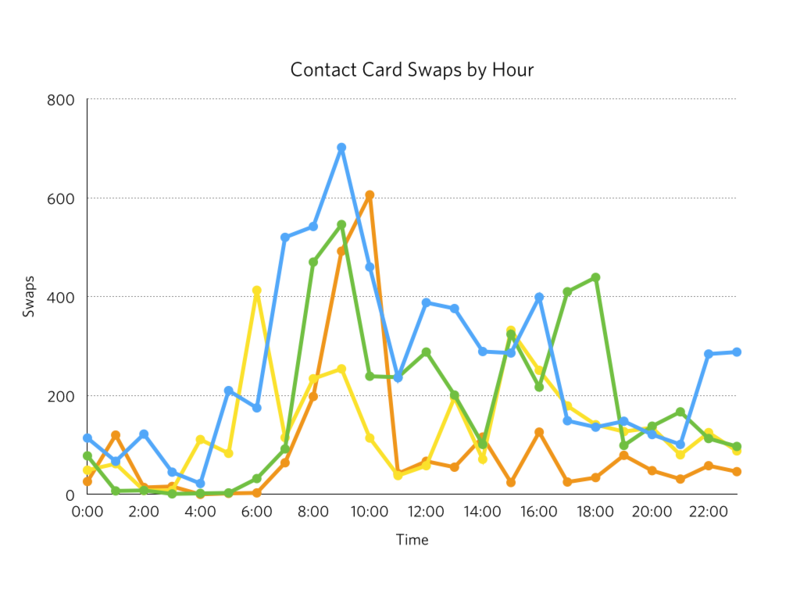 From the graph, we see a trend that the highest activity of card swapping happened between the hours of 7:00 and 11:00 am. It seems as though people are more likely to actively network before lunch. We could take this information into account when planning next year’s event and schedule structured networking events in the morning when people are primed for it. Or, depending on our goals, we might want to encourage even more swapping and find a way to incentivize contact swapping in the afternoon. This way networking remains a constant part of the day’s activities. Successful event engagement is the difference between a lively, productive event and a forgettable one. Take some time to identify what attendees will be hoping to get out of your event and exceed their expectations. This will not only leave you with happy attendees, but keep them coming back for years to come. People want to make connections – with you, your brand and with other attendees. Make it easy on them and make event engagement a critical part of your game plan. Looking to really master attendee engagement at your events? Click below to download our free eBook!